Squash House Quilts: The Stack Grows and a Whole Lot of Snow! In case you're wondering where I've been these days, I'm still knee deep in my scraps making blocks! You're looking at 350 here! At first I was going to make the quilt a bit smaller than the original pattern. Yesterday I measured the rails on my longarm and found that I had plenty of room to make the full quilt, which takes 440 - 5" squares! I stack them in sections of 10 with 100 in each stack. I realized I had to have a system so I would know just where I am in the count. My memory isn't as good as it used to be! 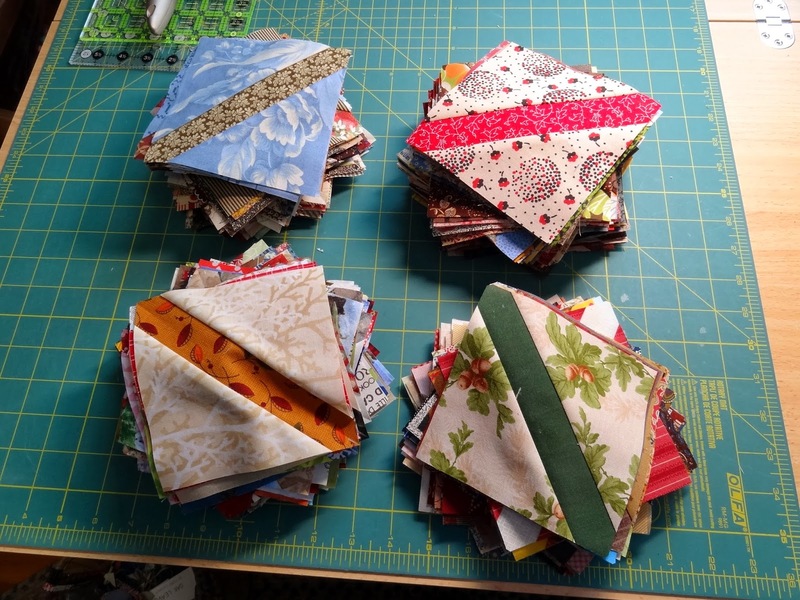 The other day I began to realize that I may run out of scraps. I am really trying hard not to have very many fabric repeats. Then I realized I had stacks of partially used charm squares. I wasn't sure if I could get a 5" block from them, but it turns out I can! I just have to be very careful when trimming them down. I cut them on the diagonal and use a 7" strip down the middle. That gives me just enough to trim off the pinked sides and a bit more. One of the reasons Mr. Squash and I moved to this side of the state for our retirement was to have more defined seasons. In four winters here we haven't had much snow - until the past few days! I swear we've had close to a foot. It's just gorgeous - light and fluffy because it's been so cold. It's even relatively easy to drive in. I took this photo from the dining room yesterday morning. This was taken on Thursday. Mr. Squash goes out every day and completely clears the driveway, sidewalk and walkway. What a trooper. A friend of mine said she wasn't sure if he was waving in the photo or "making a gesture" under that glove! I vote for a gesture! I am not thrilled with snow -- only when someone else has it. :o) I think your quilt is going to be amazing. I think with as many blocks as you've already completed...they must be potato chip sewing too! 440 five inch squares???? OMG. You're a braver woman than me. We did get dumped on (with snow) didn't we? Makes for great days to sew and looks like you have been making the most of it! Your scrap blocks are wonderful! I can't believe you might run out of fabric. I can send you some if you do. lol Love the look of the fluffy snow. I like it at first, but get tired of it pretty fast. What nice stacks of blocks you have! 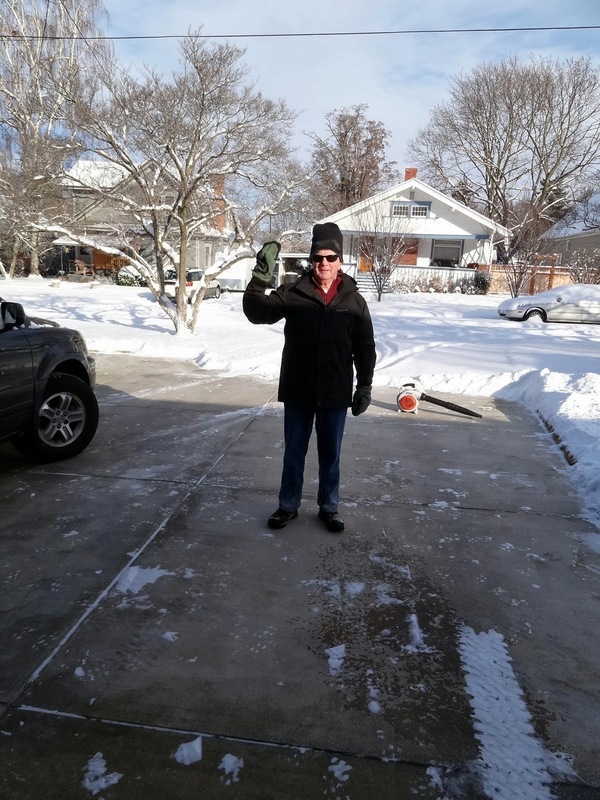 Let's see...a foot of snow and Mr Squash keeps the driveway and sidewalks clear...yep...my bet is on the gesture! Wow you've been busy - I can't wait to see your scrap quilt all put together. I think it will be beautiful!! I have enjoyed the snow, we've got a little bit less than you, but enough already, I am looking forward to spring. We have to drive to Spokane at the end of the week, so I hope the snow has stopped for now. Hugs!! That is a lot of blocks...I'm happy that "Vinny" will accommodate the larger quilt because that is what you wanted. I'm excited to see it on the quilting machine! Your scrappy blocks are coming along fabulously! Can't wait to see how they will be laid out. 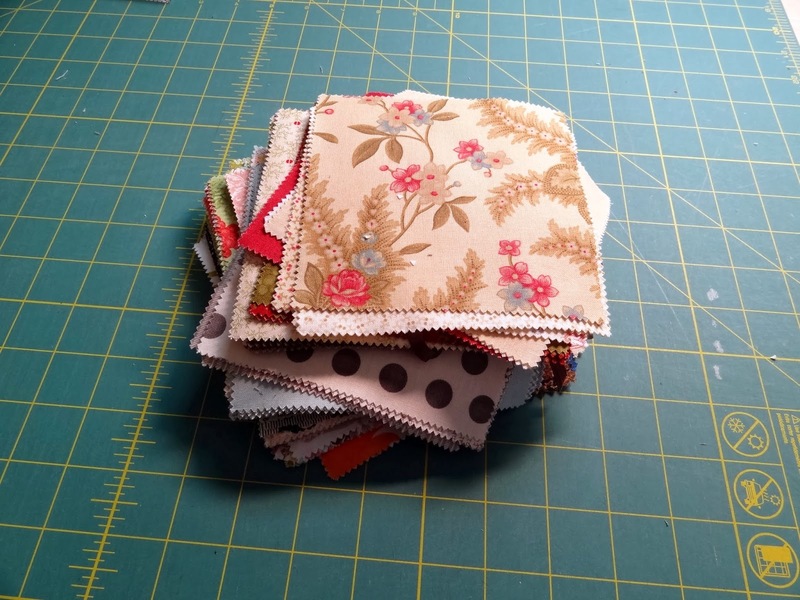 Oh, oh, oh, I love seeing your piles of little Quilty things! Can't wait to see more of the progress! With so many blocks I can see why a plan is a necessity! 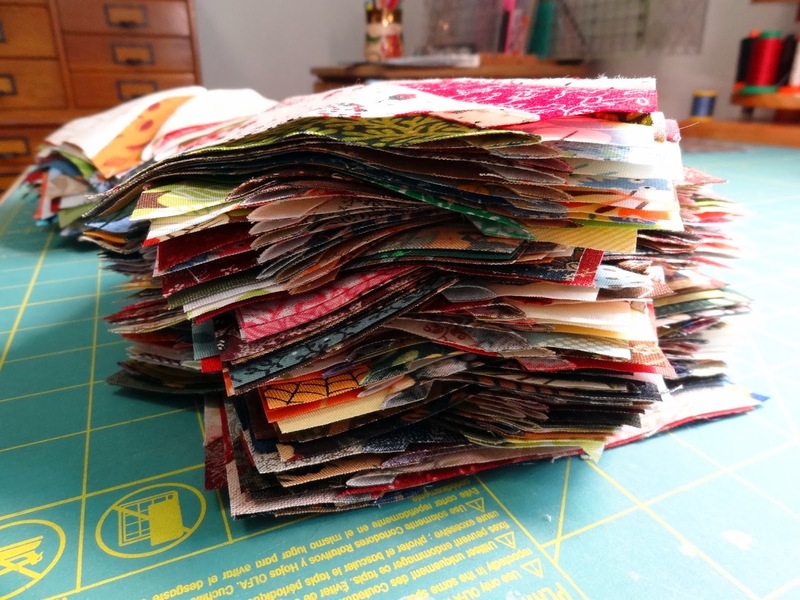 If you're running low on scraps, just let me me know a general size and type and I probably can find some to send to you. I'd love to pass some on! Those blocks are going to make a great quilt. The snow looks beautiful. You guys have been hammered with it this past week. He was waving. We know he's a nice fellow. Of course, if it WAS a gesture, it would be a PEACE sign. Yes. We've got our share of white stuff now too. The kids are delighted and they're sliding everywhere there's a hill. So much fun. Like the first year we had sleds. Up until we got store-bought sleds, all we had were little things with wooden runners that didn't go anywhere unless they were pulled. Then, we got store-bought sleds for Christmas. I still have mine in the garage. But, no snow, that Christmas. Dreary. January came, though, and, with it, snow, snow, snow. Glorious sledding after school, after dinner, weekends. Oh wonderful white stuff......WOW your blocks look great. I can hardly wait to see what comes of all this scrappiness. That's a lot of little blocks and a lot of snow too. That looks like a leaf blower next to your husband. Please tell me that helps remove snow. I have neighbors that shovel for me but that would be such a help and I could do some. I love the idea of the quilt and I can't wait to see the finished product! WOW! That is alot of blocks but so cute ! Great way to use your scraps! You sure got alot of snow ! What a great way to use the left over charms as well as your scraps. Your snow looks so soft- here we've had 100 mph winds and gales galore. I love the serenity of your snow. Is he using a leaf blower to move the snow? If so that is really light and fluffy snow. Your squares are so pretty! You will have such fun arranging them for the final setting. You have more snow than we have had all winter, until now at least. Light, dry snow is the most welcome form. 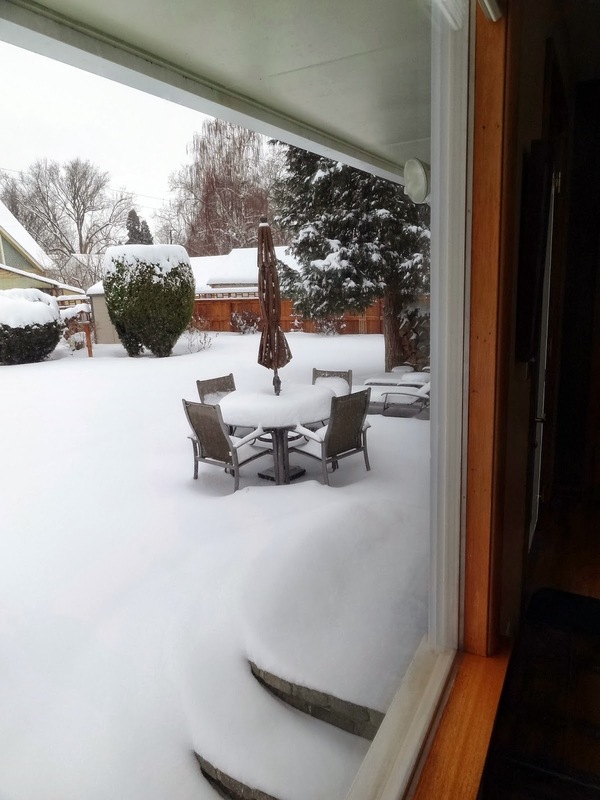 If it were me in that photo, I would definitely be raising a certain finger to indicate my feelings for all the snow we've had here in the Chicago area this year. No question about it!!!! !